The flop read 10 7 5 when Annette Obrestad bet 700 and Lee Nelson made the call. The 10 fell on the river and Nelson bet 2,350. Obrestad made the call. The river fell 3 and the former Aussie Millions champion fired out another bet, this tim tossing in 3,500. Obrestad thought for a moment but she then mucked her cards. Kiwi poker professional Lee Nelson has busted out of the tournament near the end of level 1 when his A-J ran into a 5-3 that made a full house. The 2006 Aussie Millions champion is out. With 20,000 in the pot, and a board of 7 5 5 sitting on the table, Lee Nelson raised 12,500. The button then moved all in for 30,900 and Nelson went into the tank for a while. He eventually mucked and his opponent flipped over K-Q as he collected the pot. Another Team PokerStars Pro, Lee Nelson, has surpassed Daniel Negreanu for the chip lead. He won a large pot where he held a higher full house than his opponent and he now sits atop the field. 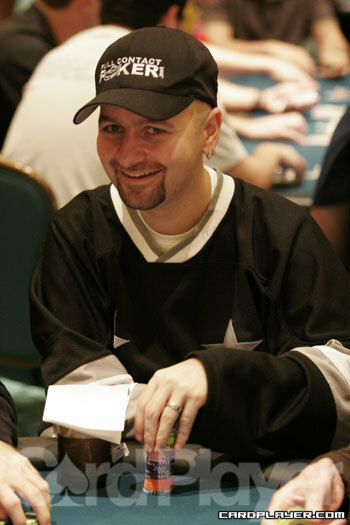 Daniel Negreanu started the day 4th in chips but has quickly risen to become chip leader. In the first hand, Negreanu, from the small blind, called Lee Nelson’s pre-flop raise. On a J 9 7 flop, Negreanu check-raised Nelson, who decided to call and see the turn. Negreanu bet out at the 8 turn, garnering another call from Nelson. The river brought the 8 and Negreanu fired another barrel. Nelson had had enough though, and folded quickly. Nelson was left with only 10,000 after the hand. Only a few hands later Negreanu’s luck would continue. An Tran raised under-the-gun and was met with a three-bet from Negreanu on the button. Tran called and the pair saw a Q J J flop. Negreanu was checked to and forced Tran out of the pot with a bet. “Two tens, boss,” stated Negreanu, who confirmed his statement by tossing his cards in face-up. Negreanu has chipped up to about 50,000 after today’s first round of play. Matt Matros opened the betting with a raise from the cutoff and was quickly met with a re-raise from Jed Dickerson on the button. Matros called the bet and checked a Q 7 6 flop. After Dickerson made a continuation bet, Matros raised him, causing Dickerson to lay down his hand. After this hand Matros’ stack was boosted to a hearty 28,000. Dickerson is languishing with only 12,000. Shortstack Mike Patrick raised to 1,200 from middle position and got one caller in Matt Hawrilenko from the small blind. Hawrilenko check-called the 7 5 4 flop. He checked again on the J turn, and after Patrick had bet, asked to see how much he had left. Patrick lifted his hands to reveal a paltry 700 left behind. Hawrilenko tossed in his chips to make the call. The river was the 8 and Hawrilenko again checked. Patrick put in his final chips and Hawrilenko shook his head and folded. Hawrilenko is now left with 11,000 in chips while Patrick was able to double his stack to about 7,000. Lee Nelson is all in for 7,800 with A J , against his opponents' A K . The board rolls out K 8 3 9 3 and Nelson makes a flush on the river to double up to 16,000 and survive.